From the way Google and Amazon have been pushing smart speakers it's clear the two companies won't be satisfied until you have a Google Home or Amazon Echo in literally every room in your house. But while that's easy enough when a room is full of surfaces, it's a little more difficult in rooms like the hallway, which are a little more light on places to put them. Enter a new wall mount for the Google Home Mini. Produced by Incipio, in partnership with Google, the mount should make it easy to blanket your home in Google Assistant coverage. However, while making sure a smart speaker can hear you no matter where you are in your house is one thing, if we learned anything from CES it's that the days of a dedicated smart speaker might be numbered. After all, with the likes of Alexa and Google Assistant now being built into everything from soundbars to televisions and even thermostats, you might find that you soon have a voice assistant in every room in your house without going to the effort of wall-mounting speakers. 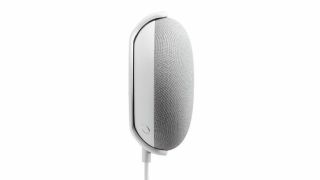 The Google Home Mini wall mount is currently available from the US Google Store for $15. There's no word yet on UK or AU availability or pricing.